We had a whole different post planned for today, but with a group now appealing the sale of Caritas to His Holiness Pope Benedict XVI, we need to share what we feel are some rather alarming coincidences with you about the pending sale of Caritas to Cerberus. Payoffs to Attorney General Martha Coakley? We all know that the Attorney General has to approve the sale of Caritas to Cerberus. And we already knew from this March 2010 Boston Globe report that Caritas CEO Ralph de la Torre and other Caritas executives gave more than $34,000 to Coakley during her campaign for U.S. Senate last year. (De la Torre said that he donated to and raised money for Coakley because of her position in favor of national health care reform, but keep reading) And we knew from this Boston Globe report that a three-hour meeting last November between de la Torre and Robert Nardelli, a top executive at Cerberus Capital Management (which took place at the Marriott Desert Springs Resort & Spa in California) paved the way for the New York-based private equity firm to buy Caritas for $830 million. Here is what we did not know previously. Robert Nardelli was a keynote speaker at the Ernst and Young Strategic Growth Forum 2009 held at the Marriott Desert Springs November 11-15, 2009. We are told that is where the meeting between de la Torre and Robert Nardelli took place. No big deal? 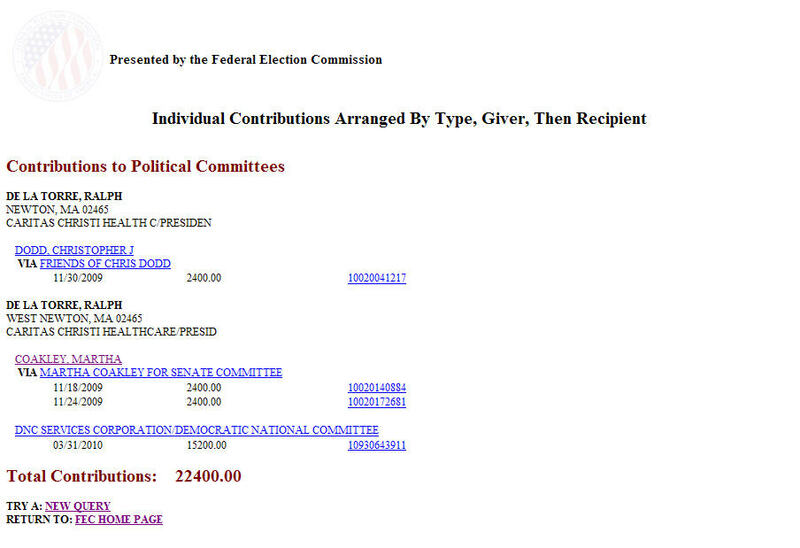 Well, by coincidence, 3 days after the conference ended, on November 18, Federal Election Commission records show that de la Torre made a donation of $2,400 to Martha Coakley’s campaign (see picture to the right). He made another donation of $2,400 on 11/24/2009. Coincidentally, Justine Carr, Caritas’ Chief Medical officer also made a $2,400 donation to Coakley’s campaign on November 18. To be fair, de la Torre’s wife, Wing, had made $4,800 in donations earlier in the fall, as had other Caritas officials. But one cannot help but ask questions about the timing of the conference/meeting where the deal was set in motion and de la Torre’s donations to the person who would approve the deal. Why did de la Torre and his Chief Medical Officer coincidentally affirm their support for Coakley with $7,200 in contributions just days after he returned from the meeting with Nardelli that paved the way for the deal? Was this just a coincidence? There are many of these, so we list just a few. Jack Connors is chairman of the board of Partners, today a competitor to Caritas, but in the future a likely potential acquirer of the best Caritas properties when Cerberus wants to sell them in a few years for a profit. Connors introduced Ralph de la Torre to the search committee that hired him as CEO of Caritas. Connors is also on the Boston archdiocesan finance council that approves deals like the sale of Caritas; he helped secure the archdiocese’s former Brighton property for his alma mater, Boston College; he is running the Catholic Schools fund-raising campaign, he is leading the search for the new Secretary for Development, he drove a cabinet reorganization; he was on the Meade-Eisner reconfiguration commission that reviewed and reversed parish closing decisions a few years ago; and he is close friends with Ann Carter of Rasky Baerlein, who played a key role hiring the Chancellor, Jim Mcdonough, who also plays a key role approving the sale of Caritas. Jack Connor’s advertising firm, by coincidence, hired Mcdonough’s daughter (a recent college grad) as an assistant media planner, even though her previous work experience was just in a short-term job her father helped her get at the archdiocese shortly after the “no nepotism” policy was communicated. Jack Connors wields a LOT of power in the archdiocese. He is on the record saying, “The decision of the church to get out of the business is brilliant.” (Any concerns about the future Catholic identity of Caritas are hardly abated by that statement). According to FEC records, Connors, his wife, and children also gave more than $14,000 to the Martha Coakley campaign last fall. It is logical to conclude that Ralph de la Torre, CEO of Caritas Christi, is indebted to Jack Connors of Partners for introducing him to the search committee. Last August, the Globe reported that De la Torre has actually met with Thomas P. Glynn, chief operating officer at Partners several times over the past year to compare notes about managing hospitals in a tough economy. It is nice that these two guys get together to compare notes, but these discussions between competitors would raise more questions about the possible collusion in planning the future for Partners, de la Torre, and Caritas hospitals that could be sold. Also, as we reported previously, one of de la Torre’s first management hires after becoming CEO was chief marketing office, Brian Carty, who by coincidence was a former top executive at Jack Connor’s advertising firm, Hill Holliday. John Kaneb, CEO of HP Hood, is a name we have not mentioned much on this blog, but you may see more of his name. He has been chair of the archdiocesan finance council and is currently vice-chair. By coincidence, he is also a trustee of Partners, parent of Mass General and Brigham and Women’s hospitals, where he serves on the board with Jack Connors. So Kaneb would have an interest in whatever benefits Partners in the future. By coincidence, Kaneb also played a key role on the search committee that picked Ralph de la Torre as the CEO of Caritas, despite a rather obvious conflict of interest he had as Partners board member. That search committee included Fr. Bryan Hehir’s friend from Catholic Charities, Neal Finnegan, as well as James Karam. Kaneb is also a part-owner of the Boston Red Sox, and Chancellor McDonough has bragged widely in the chancery to others about being invited to sit in Kaneb’s box at Fenway Park. (The Chancellor, who has approval input to the Caritas sale, has even used those coveted box seats from Kaneb to reward or induce “good” behavior by key employees). What is Cerberus’ internal plan, exit strategy, and timeframe for the Caritas investment? Given the recent financial prosperity reported by Caritas ($30M profit, Moodys upgraded bond rating), why does this transaction need to happen? Why haven’t the full findings of the report by Navigant Capital Advisors on the valuation of Caritas relative to other comparable hospital sales been released to the public? When will it be released? How much of the $830 to $850 million investment publicly announced is expected to come from Caritas current assets, internal funds and future operational profits, and how much is from Cerberus’ own funds? Has anyone representing Cerberus, formally or informally, ever talked to anyone from Partners, formally or informally, about Partners buying selected Caritas hospitals in the future? Has no one with an interest in Partners ever had a hand in determining whether or not Caritas would be sold, to whom it would be sold, for how much, the terms, and what Cerberus will ultimately do with the hospitals? (Actually, given the above, we should probably instead be asking, “Given that many people with conflicts of interest have played a role in the sale of Caritas, how can anyone still pretend this deal should go through?). Why is the Chairman of Partners so involved in making sure Caritas is sold to Cerberus? Why is Jack Connors’ friend Martha Coakley apparently pleased with the whole arrangement when so many others say it doesn’t pass the sniff test? What role has the chancellor, Mr. McDonough, played in making Jack Connors happy about the sale of Caritas (especially given that McDonough’s daughter was hired by Connors’ firm, Hill Holliday and Jack Connor’s friend Ann Carter played a key role in hiring McDonough)? Why hasn’t Martha Coakley enforced her absolute obligation, as constitutional head of the Division of Charities to protect the stakeholders (donors, patients, employees) of these non-profits by detecting, eliminating and punishing those who are wallowing in their blatant conflicts of interest? Does that represent enough coincidences for one day? Cardinal O’Malley, are you reading this? Or should people just fax their concerns directly to the Holy Father and Papal Nuncio? This entry was posted on Thursday, August 12th, 2010 at 8:04 am and is filed under Cardinal Sean o'malley, Caritas Christi. You can follow any responses to this entry through the RSS 2.0 feed. Both comments and pings are currently closed.